The Whitefish Press is an admirable enterprise with a steadily lengthening history of publishing books that ought to be printed, with the result that its catalogue is an Aladdin’s cave for specialists of every shade of interest. They have brought out a flood of titles of interest to tackle collectors in recent months and probably have the best selection of books on American baits available at the time of writing. 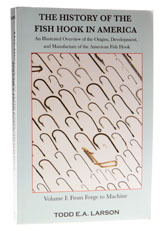 The History of the Fish Hook in America is by the publisher himself, the incomparable Dr. Todd E. A. Larson and is a collection of heavily footnoted articles about the early history of hook manufacture in the US - and in Europe, because imports made up the bulk of early American hooks. As a reference work it is hard to beat and if you are at all interested in the history of hooks, then it should be read in conjunction with Hurum’s A History of the Fish Hook, published by Black (in English in 1977) and now out of print. It is probably with this in mind that Larson has included some overlap with Hurum’s work, which is hard to get hold of and is largely a history of Mustad in any case. The only real issue I have with The History of the Fish Hook in America is that it is only available as a soft back and my copy is in danger of being referenced to bits, but as an object lesson in how to write entertaining history it knows few equals.